I’m finally able to post some of the magazine features I got these past months. Coincidentally, both are “lists”. I remember how as a kid, I used to love magazine issues with those big “list” editorials. You know, like “the best dressed/most stylish”, “the ones to watch out for”, “most beautiful”, “the creatives” etc. I don’t know why but they really excite me–everything from the people to the articles to the creative concept. More about my feature on MEGA and what I wore for its most stylish editorial here and here. More about this feature and what I wore here. Congratulations!! You are really inspiring… I hope one day I can find that niche where I can be an inspiration to others too..
Aww! I should have bought that Mega mag when I was at Trinoma last Sat.! Wow! 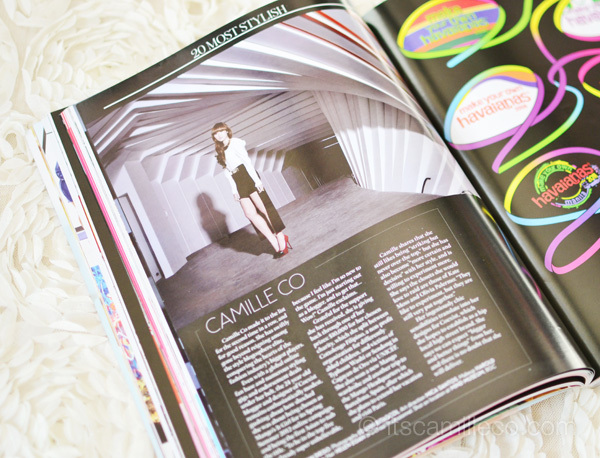 <33333333 Congrats Camille Co! You deserve that! i am truly a fan of your now! Thank you so much Denisse! Wow! Again congratulation too you!! congratulations … i’m so happy for you.. :) you deserve that .. Congrats!!! How many magazine features do you have in total? =)) Hope there will be more! Thank you! I don’t know haha! Woah! Congratulations Camille! You totally deserve to be in those lists! :) It’s so cool! Haha :D Anyways, I hope you could read my long email for you and I hope you reply. :) it’s long, but not very long. Hahaha! Lol. Ohwell, Congratulations again! Thanks Stef! I hope so too! Hi Camille! I saw you last night at Bonifacio High Street but I’m too shy to greet you. You’re so pretty! Awww sayang. :( Thanks April! Awww thanks Dheya! Kahit makasali lang, hindi kailangan top haha! You really deserve to be listed. congrats and i hope to meet you some day .. in Colombia!! Good Job Camille! I’ve been watching some of your video on youtube to keep me motivated on what I want to do. Cheers! 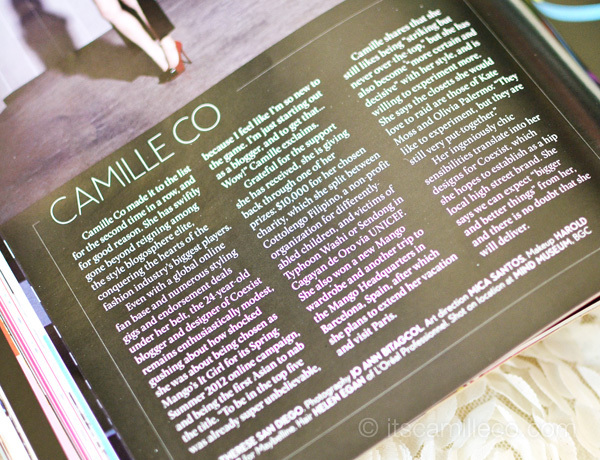 Keep on blogging camille. Why don’t you try showbiz?haha. I think you look good in tv. *wink. Haha I don’t think it’s for me :) Thanks Cath! By the way, any updates about the Mango “it girl” contest? What?!?! I missed it??? I will certainly look for it right now! You deserve it Ms. Camille! I so love the long legs :> Gives me goosebumps. Seriously. Haha! Ay! Bongga! :) Thanks Vina! You deserve it Ate Camille! Btw, how do you keep your body sooooooooo slim and fab? I’m really curious. Haha! I love how you’re the only girl sitting on that bench. Girl Power! you have AMAZING style! i love it so much! You really have style, definitely you have to stay in magazines! 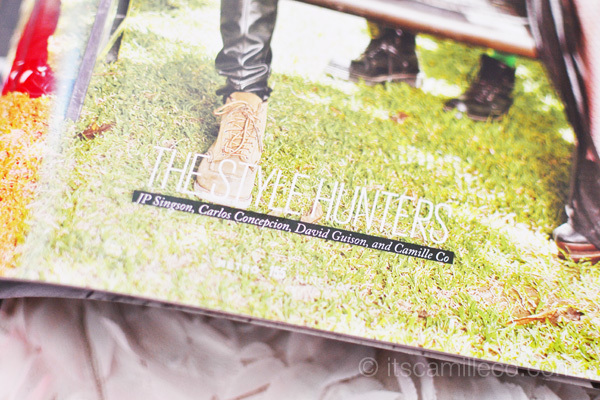 I really love all your styles, reading your blog actually become my daily routine! Please continue to be an inspiring fashion blogger! Sana you approached me :) Thanks Ayah! Always inspirational! Influential! Fashion to the max! i think you deserve to be in the cover of 2 most prestigious magazines. so fab and gorgeous you are. With a super creative mind and kind heart like yours, you totally deserve all of this and more! Congrats Ms. Camille! That’s awesome. I find it equally touching as well that you guys take time leave comments :) It’s the least I can do. Thank you Nicole! Awww that’s so sweet! Thanks Pat! Im a fan since Day 1!!!! ms.camille..is it really 2011? ?i guess its 2012…anyway, u must be so happy being in that list :) congratulations!!!! Oh yeah! Haha sorry! Thanks Krisler! Oops! Corrected :) Hindi ko namalayan 2012 na pala! :) Thanks Patrice!